By reviewing the FAA SDRS database, we can quickly draw context to 60 Minutes’ claim. While 60 Minutes limited their search to eight airlines (seven plus Allegiant) we do not have such limitations and can look at the entire North American airline fleet. The implication of this is important. If 60 Minutes would not put their family on an Allegiant flight due to their safety record, what would they do with the 16 other airlines with worse records? As with any analysis, data transparency is important. The investigation limited the number of airlines to eight, and the timeline of the investigation to a very short period of just 22 months. Those happen to be the 22 months were Allegiant saw their highest incident rate, while the lower rates before and after were not included. Of the eight airlines analyzed by 60 Minutes, Allegiant was one, and only five others were used to make the 3.5 times claim: Delta, United, American, Spirit, and Jetblue. No information was provided as to the other two airlines analyzed, what their incident rate was, and why they were excluded from the study. This led to questions of transparency from the 60 Minutes report which clued us in to some potential issues with their conclusions. As such, in our analysis we went back 10 years and included the top 25 airlines by size to provide full transparency and context. All airlines are U.S. registered passenger airlines, and each individual airline is shown. However, I have anonymized each of the other airlines to prevent any other pitch forks and torches from being raised without full context, an ironic conclusion not warranted from a blog post on the importance of finding context. One exception is the chart below, which shows the 5 airlines chosen by 60 Minutes and how they compare with the rest of the industry and Allegiant. In the report and subsequent Overtime piece about the investigation, 60 Minutes disclosed the reports they received as the Service Difficulty Reports which they received as part of a Freedom of Information Act request. It took them 7 months to conduct the study after a long process to get the FAA and Allegiant to release the data, according to their report. I offer no explanation as to why it took the FAA so long to release the information on the eight airlines other than to point out that it took us 2 hours to find the information on all airlines. Speculation has suggested that making a formal Freedom of Information Act request for information that is already publicly posted on a website by an investigative journalist could raise red flags within the FAA and Allegiant and be interpreted as a hostile move. That still would not excuse the FAA or Allegiant for objecting to the release, which seems to have escalated the tension of the story. It was important that we conduct this study with the same information set handled by 60 Minutes to provide the required context. We also made the same categorization, which is easy to replicate since each of those events has a specific code in the SDR. We can also replicate the 100 number when we limit our data to the 22 months disclosed in the 60 Minutes study. In short, making sure we were comparing the same data was important and in this case we are looking at an apples to apples comparison. To calculate the rate per departure and hour, we pulled data from the DOT form 41 table t.2, which summarizes all flight departures, hours, miles, etc. for each of the airlines. 2018 data is limited to Q1 (January 1st – March 31st) and uses scheduled departures and hours, since final reporting is not yet out on all airlines. It also only includes one quarter versus four quarters as depicted in all other years. However, since it is a rate and not an absolute number, it is accurate and reflective of the incident rate so far in 2018. Is Allegiant a Safe Airline? At the core of the 60 Minutes investigation is the assertion that Allegiant is not safe. The report bases this assertion on the Service Difficulty Reports, but also from anecdotes of engine failures and evacuations reinforced by emotional interviews with passengers on those specific flights. It is important to point out that every airline has reported engine fires/failures, smoke in the cabin, aborted takeoffs, and evacuations. This week’s tragic engine failure on the Southwest flight is a great example of how things happen even to the safest of airlines, and Southwest’s safety record is widely regarded as excellent. 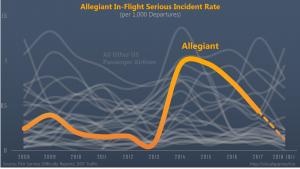 Separating the individual anecdote from overall trend and context is critical, it is why Southwest is not and should not be considered an unsafe airline, and is also why Allegiant is not and should not be considered an unsafe airline. In 2018, Allegiant is now one of the safest airlines in a country with very safe airlines. Something happened during 2014 and 2016 to increase their serious incident rates. It was a concern (emphasis on the past tense), however at no point was Allegiant the highest in serious incident rates, let alone “unsafe”. 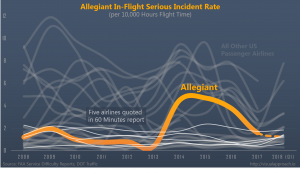 In fact, in this author’s opinion, all airlines in the U.S. are safe airlines, including those with higher incident rates than Allegiant which were omitted from the 60 Minutes report. This in no way excuses Allegiant from the maintenance challenges they saw between 2014 and 2016. It is also worth nothing that this was during a period of intense pilot negotiations from 2014 to 2016, that resulted in lawsuits, restraining orders, and a questionable termination of a pilot who ordered an evacuation following an engine failure (again, the need for context is reminded before pitch forks and torches are raised). But, the correlation between the elevated incident rates and pilot negotiations is just that, a correlation, and not causation. It is Allegiant’s responsibility to ensure they are operating a safe airline regardless of other events that may be happening at the airline. 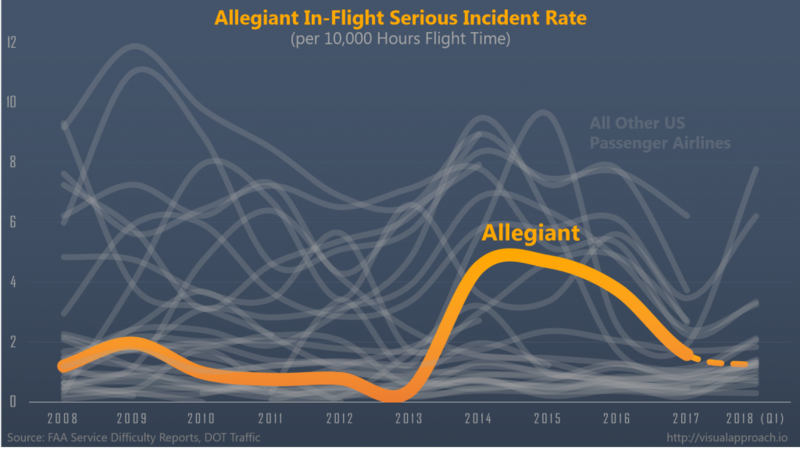 Allegiant has done this, reducing their serious incident rate by 70% since its peak; a peak that was never the highest in the country. Regardless, when looking at the full context and using the same methods used by the 60 Minutes investigation, Allegiant is clearly a safe airline. In 2018, Allegiant is now one of the safest airlines in a country with very safe airlines. 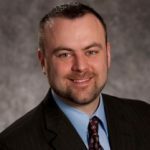 Would I allow my family to fly Allegiant? As usual, fake news CBS uses selected metrics that fit their “Allegiant is an unsafe airline narrative”. They should be sued by Allegiant for their defamatory, salacious misrepresentation of the facts. I used to listen to the news and 60 minutes and think it was reputable information but now you have to figure out what is correct and who they are biasly representing. Sadly enough we are confronted with fake “news” as President Trump complains about. Sad day for the media. Listening back through the report I think you are mostly right. Doesn’t sound like there was an engine failure, however the fire crew did say there appeared to be smoke coming from the engine. It sounds like there is a lot more to that story than we know. In particular, what history did this pilot have prior to this incident? Very well written article. It’s refreshing to read unbiased news. Thank you for assisting the flying public to understand that w can’t rely on so called investigative reporting. What would drive 60 Minutes to sully their reputation by obscuring the whole story and making the facts for their conclusion. Thank you for your research and an unbiased look at the facts. I have flown Allegiant over 32 time since April 2014. Their convenient airports, flight times and reasonable costs have been appreciate by myself and a number of family members. I, for one, will continue to fly Allegiant. If Allegiant advertised more nationally with CBS I wonder if this report would have run at all? It appears that some other airlines with safety issues much more problematic than Allegiant were not profiled. I would like to see a graph comparing the advertising money spent by each of those airlines at CBS vice the amount spent by Allegiant. Cool and interesting observation. I hope that ad incomedoesn’t drive their decisions. We now know that 60 Minutes nee CBS is an unreliable source of information. If CBS is vulnerable, I hope that Allegiant will sue, sue, sue… It goes to confirm that the media are propagandists. Perhaps CBS is entitled to a “fake news” award such as has been the exclusive label of CNN reporting… otherwise known as ratings pursuit by false, half truth or misleading headlines and stories. any thoughts on why the incident rate increased significantly in 2013 and then has been declining subsequently? Please tell us of ANY information that was inaccurately reported by 60 Minutes. Thank you so much for doing some proper journalism and bringing this to light. I knew the 60 minutes report was full of bias, especially when they read from one of those incident reports: “Flight Instrument Malfunctions” as “Flight Control Malfunctions”. Two WILDLY different things. Why would a graph that shows a bunch of squiggly lines with no labels carry any more weight than 60 minutes’ say so? One only need recall the Value Jet tragedy in FL’s Everglades and the continuation of the poor care given to what followed, Allegiant, and it’s seeming use of “what ever” upkeep. Would I fly on Allegiant? Not “NO”, but “Hell No” . Let me guess, the persons with the “Fake News” comments voted for trump, the king of lies and “fake news” himself. This article has nothing to do with Trump. Can there be any kind of a discussion without throwing Trump under the bus? Comparing MD-8X series and A32X series operators, and discounting different operators’ transparency (or not) in SDR reporting (qualitative, cultural), how do those operators’ “more serious” (IFSD, ATB, O2, PRESSURIZATION, you pick ’em) raw SDR rates stack up, as close to apples to apples as can be? Stats and numbers are necessary to determine safety trends and decision making but critical thinking, context, and big picture apply as well. Thanks for analyzing and sharing. Great article. Can you please provide the names of the 16 other U.S. passenger airlines with a higher incident rate than Allegiant? Thank you. Hey Courtney, I’m developing a case study of Allegiant’s response to the 60 minutes story for a class as part of my master’s degree in Communications, and stumbled across your site. I’d like to cite your article and charts, but hoping to learn a little bit more about you, your background and VisualApproach.io, if possible. Please feel free to contact me at the email address I included as part of this reply. Thanks so much! It is also worth ***nothing**** that this was during a period of intense pilot negotiations from 2014 to 2016, make sure your editors do a good job. Why would you do this?? ?why would you try to convince people to not fly allegiant… when things could go wrong with all of them.. not one air craft .and they all have had their problems.